I received a free copy of this book through NetGalley in exchange for an honest review. Aged Mother Jilo is wise in the ways of magic…but once upon a time, she was just a girl. Young Jilo—fiercely independent, intelligent, and ambitious, but thwarted by Savannah’s maddeningly genteel version of bigotry—finds herself forced to embrace a dark power that has pursued her family for generations, an ancient magic that may prove her salvation…or her undoing. 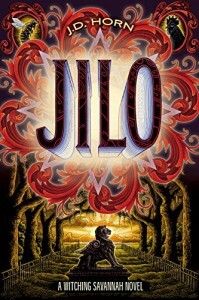 Explore the fascinating history of one of the Witching Savannah series’ most vivid and beloved characters, as the resourceful and determined Jilo comes of age, strives to master formidable magical skills in the face of overwhelming adversity, and forges her strange destiny against the turbulent backdrop of the civil rights struggle in the American South. I just wasn't able to get into it and I kept finding excuses to not read it. I can't even say why I had trouble connecting with it, which is a shame because going off the synopsis, it sounded really interesting. I'll probably come back to this at a later date and try to read it again, but for now it's being added to my DNF pile.